The behavior of electrochemical systems is widely investigated with continuum physics models. Applications range from single crystal electrochemistry to lithium batteries and fuel cells, from biological nano-pores to electrolysis and corrosion science, and further. The common basis for all application is the theory of non-equilibrium thermo-electrodynamics [1,2]. At the Weierstraß-Institute general models for electrochemical systems are systematically derived. Asymptotic analysis methods are further employed to derived reduced non-equilibrium models for various electrodes and electrolytes, and the corresponding boundary conditions. A detailed model for a general electrolytic mixture was developed, which may adsorb and react on a metal surface. It is based on coupled volume and surface thermodynamics  where we account for adsorption and solvation of the ionic species. Figure 1: Computed structure and a resulting sketch of the Ag/0.1M NaF interface. For charged interfaces in equilibrium, this model leads to a coupled Poisson-momentum equation systems , which can be used to compute the structure of the double layer (Fig. 1). It is further possible to derive the capacity of the electrode/electrolyte interface (Fig. 2), a property which is precisely measured for many materials. This allows for a rigorous validation of our model, which shows some remarkable agreement to experimental data . Figure 2: Computed capacity of the Ag(110) 0.1M NaF interface. Electron transfer reactions at the interface between an electrolyte and an electrode are the pivotal phenomenon of all electrochemical systems for storage and conversion of energy. The Butler-Volmer equation describes the dependence of the reaction rates on a potential difference across the interface and on the concentrations of the different species at the interface. At WIAS, new boundary conditions of generalized Butler-Volmer type were derived based on non-equilibrium thermodynamics . The predictive capabilities of this theory are validated for various, well defined electrochemical cells. and is applied to complex systems like batteries and fuel cells. Figure 3: Experimental setup copper deposition. Figure 4: Current-Voltage diagram for the electro-deposition of metal with different electrolyte concentrations. At high imposed currents diffusional transport in the electrolyte causes a lack of reacting ions at the electrode, leading to a blow-up of the potential. The numerical solution of generalized Poisson-Nernst-Planck systems like the one derived in  in higher space dimensions and general geometries requires the development of specifically tailored discretization approaches which have the potential to preserve the thermodynamic properties of the continuous problem. For this purpose, a generalization of the Scharfetter-Gummel upwind finite volume scheme successfully employed in the field of semiconductor device simulation to the case Poisson-Nernst-Planck problems with ion volume constraints and solvent balancing has been proposed . Figure 5: Simulated IV curves for an electrolytic diode. 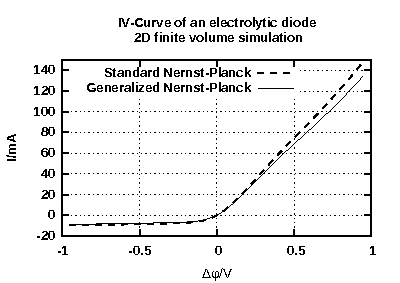 Difference between standard and improved Nernst-Planck models. As magnesium is highly abundant, comparably cheap and sufficiently reactive, rechargeable magnesium air batteries are an interesting option for large scale energy storage. The development of strategies for the realization of this battery type is the subject of the research network MgLuft which is funded by the German Ministry of Education and Research. The WIAS subproject is concerned with the model based interpretation of flow cell experiments supporting the acquisition of transport data in organic electrolytes and information or reaction kinetics  and the modeling of transport and reaction processes in the electrodes of such a cell. Figure 6: Calculated streamlines of electrolyte flow in an experimental flow cell. I. Müller, Thermodynamics, Pitman, 1985. S. de Groot, P. Mazur, Non-Equilibrium Thermodynamics, Dover Publications, 1984. W. Dreyer, C. Guhlke and M. Landstorfer, Theory and structure of the metal electrolyte/interface incorporating adsorption and solvation effects, Preprint no. 2058, WIAS, Berlin, 2014. W. Dreyer, C. Guhlke and M. Landstorfer, A mixture theory of electrolytes containing solvation effects, Electrochemistry Communications, 43 (2014), pp. 75-78. W. Dreyer, C. Guhlke and R. Müller, Modeling of electrochemical double layers in thermodynamic non- equilibrium, Phys. Chem. Chem. Phys., 17 (2015), pp. 27176-27194. J. Fuhrmann, Comparison and numerical treatment of generalised Nernst-Planck models, Computer Physics Communications, 196 (2015), pp. 166-178. J. Fuhrmann, A. Linke, C. Merdon, F. Neumann, T. Streckenbach, H. Baltruschat, and M. Khodayari, Inverse modeling of thin layer flow cells for detection of solubility, transport and reaction coefficients from experimental data, Preprint no. 2161, WIAS, Berlin, 2015. W. Dreyer, C. Guhlke, M. Landstorfer, Theory and structure of the metal/electrolyte interface incorporating adsorption and solvation effects, Electrochimica Acta, 201 (2016), pp. 187--219. In this work we present a continuum theory for the metal/electrolyte interface which explicitly takes into account adsorption and partial solvation on the metal surface. It is based on a general theory of coupled thermo-electrodynamics for volumes and surfaces, utilized here in equilibrium and a 1D approximation. We provide explicit free energy models for the volumetric metal and electrolyte phases and derive a surface free energy for the species present on the metal surface. This surface mixture theory explicitly takes into account the very different amount of sites an adsorbate requires, originating from solvation effects on the surface. Additionally we account for electron transfer reactions on the surface and the associated stripping of the solvation shell. Based on our overall surface free energy we thus provide explicit expressions of the surface chemical potentials of all constituents. The equilibrium representations of the coverages and the overall charge are briefly summarized. Our model is then used to describe two examples: (i) a silver single crystal electrode with (100) face in contact to a (0.01M NaF + 0.01M KPF6) aqueous solution, and (ii) a general metal surface in contact to some electrolytic solution AC for which an electron transfer reaction occurs in the potential range of interest. We reflect the actual modeling procedure for these examples and discuss the respective model parameters. 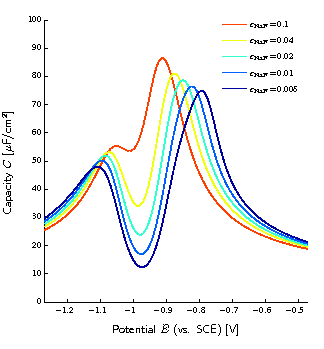 Due to the representations of the coverages in terms of the applied potential we provide an adsorption map and introduce adsorption potentials. Finally we investigate the structure of the space charge layer at the metal/surface/electrolyte interface by means of numerical solutions of the coupled Poisson-momentum equation system for various applied potentials. It turns out that various layers self-consistently form within the overall space charge region, which are compared to historic and recent pictures of the double layer. Based on this we present new interpretations of what is known as inner and outer Helmholtz-planes and finally provide a thermodynamic consistent picture of the metal/electrolyte interface structure. J. Fuhrmann, A numerical strategy for Nernst--Planck systems with solvation effect, Fuel Cells, 16 (2016), pp. 704--714. J. Fuhrmann, A. Linke, Ch. Merdon, F. Neumann, T. Streckenbach, H. Baltruschat, M. Khodayari, Inverse modeling of thin layer flow cells for detection of solubility, transport and reaction coefficients from experimental data, Electrochimica Acta, 211 (2016), pp. 1--10. Thin layer flow cells are used in electrochemical research as experimental devices which allow to perform investigations of electrocatalytic surface reactions under controlled conditions using reasonably small electrolyte volumes. 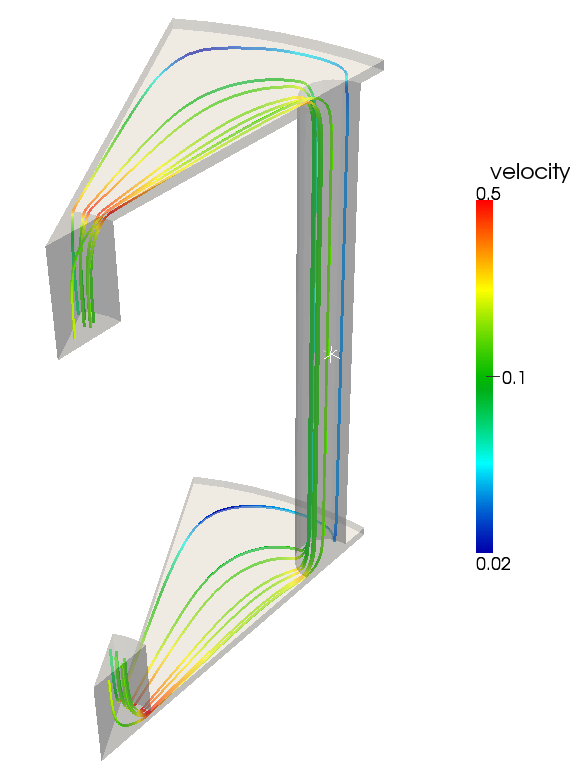 The paper introduces a general approach to simulate the complete cell using accurate numerical simulation of the coupled flow, transport and reaction processes in a flow cell. The approach is based on a mass conservative coupling of a divergence-free finite element method for fluid flow and a stable finite volume method for mass transport. It allows to perform stable and efficient forward simulations that comply with the physical bounds namely mass conservation and maximum principles for the involved species. In this context, several recent approaches to obtain divergence-free velocities from finite element simulations are discussed. In order to perform parameter identification, the forward simulation method is coupled to standard optimization tools. After an assessment of the inverse modeling approach using known realistic data, first results of the identification of solubility and transport data for O2 dissolved in organic electrolytes are presented. A plausibility study for a more complex situation with surface reactions concludes the paper and shows possible extensions of the scope of the presented numerical tools. In its most widespread, classical formulation, the Nernst-Planck-Poisson system for ion transport in electrolytes fails to take into account finite ion sizes. As a consequence, it predicts unphysically high ion concentrations near electrode surfaces. Historical and recent approaches to an approriate modification of the model are able to fix this problem. Several appropriate formulations are compared in this paper. The resulting equations are reformulated using absolute activities as basic variables describing the species amounts. This reformulation allows to introduce a straightforward generalisation of the Scharfetter-Gummel finite volume discretization scheme for drift-diffusion equations. It is shown that it is thermodynamically consistent in the sense that the solution of the corresponding discretized generalized Poisson-Boltzmann system describing the thermodynamic equilibrium is a stationary state of the discretized time-dependent generalized Nernst-Planck system. Numerical examples demonstrate the improved physical correctness of the generalised models and the feasibility of the numerical approach. In this work we derive entropy decay estimates for a class of nonlinear reaction-diffusion systems modeling reversible chemical reactions under the assumption of detailed balance. In particular, we provide explicit bounds for the exponential decay of the relative logarithmic entropy, being based essentially on the application of the log-Sobolev inequality and a convexification argument only, making it quite robust to model variations. An important feature of our analysis is the interaction of the two different dissipative mechanisms: pure diffusion, forcing the system asymptotically to the homogeneous state, and pure reaction, forcing the solution to the (possibly inhomogeneous) chemical equilibrium. Only the interaction of both mechanisms provides the convergence to the homogeneous equilibrium. Moreover, we introduce two generalizations of the main result: we allow for vanishing diffusion constants in some chemical components, and we consider different entropy functionals. We provide a few examples to highlight the usability of our approach and shortly discuss possible further applications and open questions. This is a study on electrolytes that takes a thermodynamically consistent coupling between mechanics and diffusion into account. It removes some inherent deficiencies of the popular Nernst-Planck model. A boundary problem for equilibrium processes is used to illustrate the new features of our model. CH. 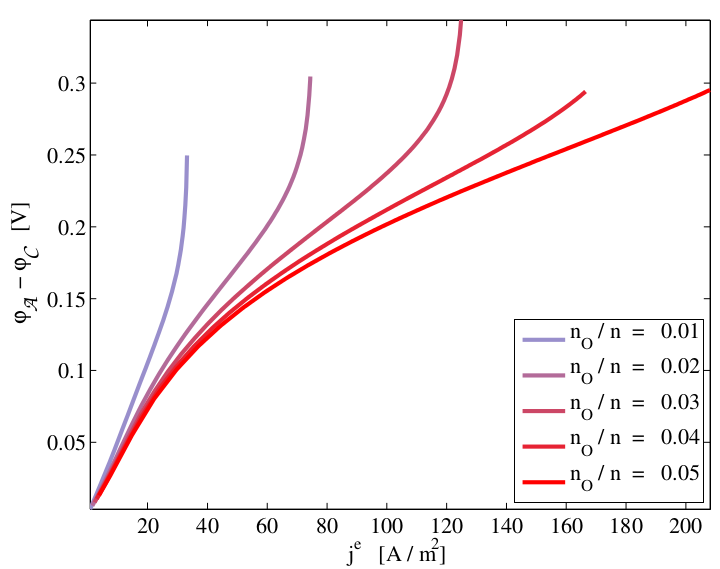 Batallion, F. Bouchon, C. Chainais-Hillairet, J. Fuhrmann, E. Hoarau, R. Touzani, Numerical methods for the simulation of a corrosion model in a nuclear waste deep repository, Journal of Computational Physics, 231 (2012), pp. 6213--6231. In this paper, we design numerical methods for a PDE system arising in corrosion modelling. This system describes the evolution of a dense oxide layer. It is based on a drift-diffusion system and includes moving boundary equations. The choice of the numerical methods is justified by a stability analysis and by the study of their numerical performance. Finally, numerical experiments with real-life data shows the efficiency of the developed methods. J. Fuhrmann, H. Zhao, H. Langmach, Y.E. Seidel, Z. Jusys, R.J. Behm, The role of reactive reaction intermediates in two-step heterogeneous electro-catalytic reactions: A model study, Fuel Cells, 11 (2011), pp. 501--510. Experimental investigations of heterogeneous electrocatalytic reactions have been performed in flow cells which provide an environment with controlled parameters. 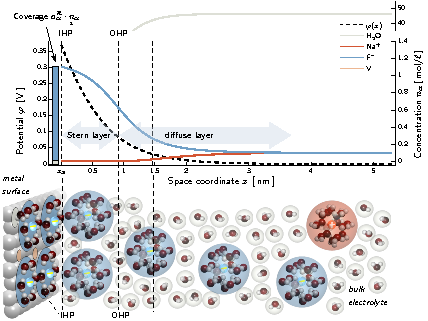 Measurements of the oxygen reduction reaction in a flow cell with an electrode consisting of an array of Pt nanodisks on a glassy carbon substrate exhibited a decreasing fraction of the intermediate $H_2O_2$ in the overall reaction products with increasing density of the nanodiscs. A similar result is true for the dependence on the catalyst loading in the case of a supported Pt/C catalyst thin-film electrode, where the fraction of the intermediate decreases with increasing catalyst loading. Similar effects have been detected for the methanol oxidation. We present a model of multistep heterogeneous electrocatalytic oxidation and reduction reactions based on an adsorption-reaction-desorption scheme using the Langmuir assumption and macroscopic transport equations. A continuum based model problem in a vertical cross section of a rectangular flow cell is proposed in order to explain basic principles of the experimental situation. It includes three model species A, B, C, which undergo adsorption and desorption at a catalyst surface, as well as adsorbate reactions from A to B to C. These surface reactions are coupled with diffusion and advection in the Hagen Poiseuille flow in the flow chamber of the cell. Both high velocity asymptotic theory and a finite volume numerical are used to obtain approximate solutions to the model. Both approaches show a behaviour similar to the experimentally observed. Working in more general situations, the finite volume scheme was applied to a catalyst layer consisting of a number of small catalytically active areas corresponding to nanodisks. Good qualitative agreement with the experimental findings was established for this case as well. A. Glitzky, Uniform exponential decay of the free energy for Voronoi finite volume discretized reaction-diffusion systems, Mathematische Nachrichten, 284 (2011), pp. 2159--2174. Our focus are energy estimates for discretized reaction-diffusion systems for a finite number of species. We introduce a discretization scheme (Voronoi finite volume in space and fully implicit in time) which has the special property that it preserves the main features of the continuous systems, namely positivity, dissipativity and flux conservation. For a class of Voronoi finite volume meshes we investigate thermodynamic equilibria and prove for solutions to the evolution system the monotone and exponential decay of the discrete free energy to its equilibrium value with a unified rate of decay for this class of discretizations. The essential idea is an estimate of the free energy by the dissipation rate which is proved indirectly by taking into account sequences of Voronoi finite volume meshes. Essential ingredient in that proof is a discrete Sobolev-Poincaré inequality. J. Fuhrmann, A. Linke, H. Langmach, H. Baltruschat, Numerical calculation of the limiting current for a cylindrical thin layer flow cell, Electrochimica Acta, 55 (2009), pp. 430--438. J. Fuhrmann, H. Zhao, E. Holzbecher, H. Langmach, Flow, transport, and reactions in a thin layer flow cell, Journal of Fuel Cell Science and Technology, 5 (2008), pp. 021008/1--021008/10. H. Gajewski, I.V. Skrypnik, On unique solvability of nonlocal drift-diffusion-type problems, Nonlinear Analysis. Theory, Methods & Applications. An International Multidisciplinary Journal. Series A: Theory and Methods, 56 (2004), pp. 803--830. H. Gajewski, I.V. Skrypnik, To the uniqueness problem for nonlinear parabolic equations, Discrete and Continuous Dynamical Systems, 10 (2004), pp. 315--336. H. Gajewski, K. Zacharias, On a nonlocal phase separation model, Journal of Mathematical Analysis and Applications, 286 (2003), pp. 11--31. A. Fiebach, A. Glitzky, Uniform estimate of the relative free energy by the dissipation rate for finite volume discretized reaction-diffusion systems, in: Finite Volumes for Complex Applications VII -- Methods and Theoretical Aspects -- FVCA 7, Berlin, June 2014, J. Fuhrmann, M. Ohlberger, Ch. Rohde, eds., 77 of Springer Proceedings in Mathematics & Statistics, Springer International Publishing, Cham et al., 2014, pp. 275--283. We prove a uniform Poincare-like estimate of the relative free energy by the dissipation rate for implicit Euler, finite volume discretized reaction-diffusion systems. This result is proven indirectly and ensures the exponential decay of the relative free energy with a unified decay rate for admissible finite volume meshes. J. Fuhrmann, A. Linke, Ch. Merdon, Coupling of fluid flow and solute transport using a divergence-free reconstruction of the Crouzeix--Raviart element, in: Finite Volumes for Complex Applications VII -- Elliptic, Parabolic and Hyperbolic Problems -- FVCA 7, Berlin, June 2014, J. Fuhrmann, M. Ohlberger, Ch. Rohde, eds., 78 of Springer Proceedings in Mathematics & Statistics, Springer International Publishing, Cham et al., 2014, pp. 587--595. J. Fuhrmann, K. Gärtner, Modeling of two-phase flow and catalytic reaction kinetics for DMFCs, in: Device and Materials Modeling in PEM Fuel Cells, S. Paddison, K. Promislow, eds., 113 of Topics in Applied Physics, Springer, Berlin/Heidelberg, 2009, pp. 297--316. M. Ehrhardt, J. Fuhrmann, A. Linke, E. Holzbecher, Mathematical modeling of channel-porous layer interfaces in PEM fuel cells, in: Proceedings of FDFC2008 --- Fundamentals and Developments of Fuel Cell Conference 2008, Nancy, France, December 10--12 (CD), 2008, pp. 8 pages. In proton exchange membrane (PEM) fuel cells, the transport of the fuel to the active zones, and the removal of the reaction products are realized using a combination of channels and porous diffusion layers. In order to improve existing mathematical and numerical models of PEM fuel cells, a deeper understanding of the coupling of the flow processes in the channels and diffusion layers is necessary. After discussing different mathematical models for PEM fuel cells, the work will focus on the description of the coupling of the free flow in the channel region with the filtration velocity in the porous diffusion layer as well as interface conditions between them. The difficulty in finding effective coupling conditions at the interface between the channel flow and the membrane lies in the fact that often the orders of the corresponding differential operators are different, e.g., when using stationary (Navier-)Stokes and Darcy's equation. Alternatively, using the Brinkman model for the porous media this difficulty does not occur. We will review different interface conditions, including the well-known Beavers-Joseph-Saffman boundary condition and its recent improvement by Le Bars and Worster. U. Bandelow, H. Gajewski, R. Hünlich, Thermodynamic designed energy model, in: Proceedings of the IEEE/LEOS 3rd International Conference on Numerical Simulation of Semiconductor Optoelectronic Devices (NUSOD'03), J. Piprek, ed., 2003, pp. 35--37. I.V. Skrypnik, H. Gajewski, On the uniqueness of solutions to nonlinear elliptic and parabolic problems (in Russian), in: Differ. Uravn. i Din. Sist., dedicated to the 80th anniversary of the Academician Evgenii Frolovich Mishchenko, Suzdal, 2000, 236 of Tr. Mat. Inst. Steklova, Moscow, Russia, 2002, pp. 318--327. G. Schwarz, E. Schöll, R. Nürnberg, H. Gajewski, Simulation of current filamentation in an extended drift-diffusion model, in: EQUADIFF 99: International Conference on Differential Equations, Berlin 1999, B. Fiedler, K. Gröger, J. Sprekels, eds., 2, World Scientific, Singapore [u. a. ], 2000, pp. 1334--1336. H. Gajewski, K. Zacharias, On a reaction-diffusion system modelling chemotaxis, in: EQUADIFF 99: International Conference on Differential Equations, Berlin 1999, B. Fiedler, K. Gröger, J. Sprekels, eds., 2, World Scientific, Singapore [u. a. ], 2000, pp. 1098--1103. W. Dreyer, P.-É. Druet, P. Gajewski, C. Guhlke, Analysis of improved Nernst--Planck--Poisson models of compressible isothermal electrolytes. Part III: Compactness and convergence, Preprint no. 2397, WIAS, Berlin, 2017, DOI 10.20347/WIAS.PREPRINT.2397 . We consider an improved Nernst--Planck--Poisson model first proposed by Dreyer et al. in 2013 for compressible isothermal electrolytes in non equilibrium. The model takes into account the elastic deformation of the medium that induces an inherent coupling of mass and momentum transport. The model consists of convection--diffusion--reaction equations for the constituents of the mixture, of the Navier-Stokes equation for the barycentric velocity, and of the Poisson equation for the electrical potential. Due to the principle of mass conservation, cross--diffusion phenomena must occur and the mobility matrix (Onsager matrix) has a kernel. In this paper, which continues the investigations of [DDGG17a, DDGG17b], we prove the compactness of the solution vector, and existence and convergence for the approximation schemes. We point at simple structural PDE arguments as an adequate substitute to the Aubin--Lions compactness Lemma and its generalisations: These familiar techniques attain their limit in the context of our model in which the relationship between time derivatives (transport) and diffusion gradients is highly non linear. W. Dreyer, P.-É. Druet, P. Gajewski, C. Guhlke, Analysis of improved Nernst--Planck--Poisson models of compressible isothermal electrolytes. Part II: Approximation and a priori estimates, Preprint no. 2396, WIAS, Berlin, 2017, DOI 10.20347/WIAS.PREPRINT.2396 . We consider an improved Nernst--Planck--Poisson model first proposed by Dreyer et al. in 2013 for compressible isothermal electrolytes in non equilibrium. The model takes into account the elastic deformation of the medium that induces an inherent coupling of mass and momentum transport. The model consists of convection--diffusion--reaction equations for the constituents of the mixture, of the Navier-Stokes equation for the barycentric velocity, and of the Poisson equation for the electrical potential. Due to the principle of mass conservation, cross--diffusion phenomena must occur and the mobility matrix (Onsager matrix) has a kernel. In this paper, which continues the investigation of [DDGG17a], we derive for thermodynamically consistent approximation schemes the natural uniform estimates associated with the dissipations. Our results essentially improve our former study [DDGG16], in particular the a priori estimates concerning the relative chemical potentials. W. Dreyer, P.-É. Druet, P. Gajewski, C. Guhlke, Analysis of improved Nernst--Planck--Poisson models of compressible isothermal electrolytes. Part I: Derivation of the model and survey of the results, Preprint no. 2395, WIAS, Berlin, 2017, DOI 10.20347/WIAS.PREPRINT.2395 . We consider an improved Nernst--Planck--Poisson model first proposed by Dreyer et al. in 2013 for compressible isothermal electrolytes in non equilibrium. The model takes into account the elastic deformation of the medium that induces an inherent coupling of mass and momentum transport. The model consists of convection--diffusion--reaction equations for the constituents of the mixture, of the Navier-Stokes equation for the barycentric velocity, and of the Poisson equation for the electrical potential. Due to the principle of mass conservation, cross--diffusion phenomena must occur and the mobility matrix (Onsager matrix) has a kernel. In this paper we establish the existence of a global--in--time weak solution for the full model, allowing for a general structure of the mobility tensor and for chemical reactions with highly non linear rates in the bulk and on the active boundary. We characterise the singular states of the system, showing that the chemical species can vanish only globally in space, and that this phenomenon must be concentrated in a compact set of measure zero in time. With respect to our former study [DDGG16], we also essentially improve the a priori estimates, in particular concerning the relative chemical potentials. W. Dreyer, J. Fuhrmann, P. Gajewski, C. Guhlke, M. Landstorfer, M. Maurelli, R. Müller, Stochastic model for LiFePO4-electrodes, ModVal14 -- 14th Symposium on Fuel Cell and Battery Modeling and Experimental Validation, Karlsruhe, March 2 - 3, 2017. CH. Merdon, A novel concept for the discretisation of the coupled Nernst--Planck--Poisson--Navier--Stokes system, 14th Symposium on Fuel Cell Modelling and Experimental Validation (MODVAL 14), March 2 - 3, 2017, Karlsruher Institut für Technologie, Institut für Angewandte Materialien, Karlsruhe, Germany, March 3, 2017. P.-É. Druet, Analysis of recent Nernst--Planck--Poisson--Navier--Stokes systems of electrolytes, 88th Annual Meeting of the International Association of Applied Mathematics and Mechanics (GAMM 2017), Section S14 ``Applied Analysis'', March 6 - 10, 2017, Bauhaus Universität Weimar/Technische Universität Ilmenau, Weimar, March 7, 2017. P.-É. Druet, Existence of weak solutions for improved Nernst--Planck--Poisson models of compressible electrolytes, Seminar EDE, Czech Academy of Sciences, Institute of Mathematics, Department of Evolution Differential Equations (EDE), Prague, Czech Republic, January 10, 2017. CH. Merdon, J. Fuhrmann, A. Linke, A.A. Abd-El-Latif, M. Khodayari, P. Reinsberg, H. Baltruschat, Inverse modelling of thin layer flow cells and RRDEs, The 67th Annual Meeting of the International Society of Electrochemistry, Den Haag, Netherlands, August 21 - 26, 2016. P.-É. Druet, Existence of global weak solutions for generalized Poisson--Nernst--Planck systems, 7th European Congress of Mathematics (ECM), minisymposium ``Analysis of Thermodynamically Consistent Models of Electrolytes in the Context of Battery Research'', July 18 - 22, 2016, Technische Universität Berlin, Berlin, July 20, 2016. J. Fuhrmann, A. Linke, Ch. Merdon, M. Khodayari , H. Baltruschat, Detection of solubility, transport and reaction coefficients from experimental data by inverse modelling of thin layer flow cells, 1st Leibniz MMS Mini Workshop on CFD & GFD, WIAS Berlin, September 8 - 9, 2016. J. Fuhrmann, A. Linke, Ch. Merdon, W. Dreyer, C. Guhle, M. Landstorfer, R. Müller, Numerical methods for electrochemical systems, 2nd Graz Battery Days, Graz, Austria, September 27 - 28, 2016. CH. Merdon, Inverse modeling of thin layer flow cells for detection of solubility transport and reaction coefficients from experimental data, 17th Topical Meeting of the International Society of Electrochemistry Multiscale Analysis of Electrochemical Systems, May 31 - June 3, 2015, Saint Malo Congress Center, France, June 1, 2015. A. Mielke, Evolutionary $Gamma$-convergence for generalized gradient systems, Workshop ``Gradient Flows'', June 22 - 23, 2015, Université Pierre et Marie Curie, Laboratoire Jacques-Louis Lions, Paris, France, June 22, 2015. M. Liero, On dissipation distances for reaction-diffusion equations --- The Hellinger--Kantorovich distance, Workshop ``Entropy Methods, PDEs, Functional Inequalities, and Applications'', June 30 - July 4, 2014, Banff International Research Station for Mathematical Innovation and Discovery (BIRS), Canada, July 1, 2014. M. Liero, On dissipation distances for reaction-diffusion equations --- The Hellinger--Kantorovich distance, RIPE60 -- Rate Independent Processes and Evolution Workshop, June 24 - 26, 2014, Prague, Czech Republic, June 24, 2014. A. Linke, Ch. Merdon, Optimal and pressure-independent $L^2$ velocity error estimates for a modified Crouzeix--Raviart element with BDM reconstructions, The International Symposium of Finite Volumes for Complex Applications VII (FVCA 7), Berlin-Brandenburgische Akademie der Wissenschaften, June 15 - 20, 2014. A. Fiebach, A. Glitzky, Uniform estimate of the relative free energy by the dissipation rate for finite volume discretized reaction-diffusion systems, The International Symposium of Finite Volumes for Complex Applications VII (FVCA 7), Berlin, June 15 - 20, 2014. J. Fuhrmann, A. Linke, Ch. Merdon, M. Khodayari, H. Baltruschat, Detection of solubility, transport and reaction coefficients from experimental data by inverse modeling of thin layer flow cells, 65th Annual Meeting of the International Society of Electrochemistry, Lausanne, Switzerland, August 31 - September 5, 2014. J. Fuhrmann, A. Linke, Ch. Merdon, Coupling of fluid flow and solute transport using a divergence-free reconstruction of the Crouzeix--Raviart element, The International Symposium of Finite Volumes for Complex Applications VII (FVCA 7), Berlin-Brandenburgische Akademie der Wissenschaften, June 15 - 20, 2014. J. Fuhrmann, Activity based finite volume methods for generalised Nernst--Planck--Poisson systems, The International Symposium of Finite Volumes for Complex Applications VII (FVCA 7), Berlin-Brandenburgische Akademie der Wissenschaften, June 15 - 20, 2014. A. Mielke, On a metric and geometric approach to reaction-diffusion systems as gradient systems, Mathematics Colloquium, Jacobs University Bremen, School of Engineering and Science, December 1, 2014. A. Mielke, A reaction-diffusion equation as a Hellinger--Kantorovich gradient flow, ERC Workshop on Optimal Transportation and Applications, October 27 - 31, 2014, Centro di Ricerca Matematica ``Ennio De Giorgi'', Pisa, Italy, October 29, 2014. J. Rehberg, On non-smooth parabolic equations, Workshop ``Maxwell--Stefan meets Navier--Stokes/Modeling and Analysis of Reactive Multi-Component Flows'', March 31 - April 2, 2014, Universität Halle, April 1, 2014. J. Rehberg, Optimal Sobolev regularity for second order divergence operators, 85th Annual Meeting of the International Association of Applied Mathematics and Mechanics (GAMM 2014), Session on Applied Operator Theory, March 10 - 14, 2014, Friedrich-Alexander Universität Erlangen-Nürnberg, March 13, 2014. A. Mielke, Gradient structures and uniform global decay for reaction-diffusion systems, Mathematisches Kolloquium, Universität Bielefeld, Fakultät für Mathematik, April 25, 2013. A. Mielke, On the geometry of reaction-diffusion systems: Optimal transport versus reaction, Recent Trends in Differential Equations: Analysis and Discretisation Methods, November 7 - 9, 2013, Technische Universität Berlin, Institut für Mathematik, November 9, 2013. A. Mielke, Entropy gradient flows for Markow chains and reaction-diffusion systems, Berlin-Leipzig-Seminar ``Analysis/Probability Theory'', WIAS Berlin, April 13, 2012. A. Mielke, Gradienten-Strukturen und geodätische Konvexität für Markov-Ketten und Reaktions-Diffusions-Systeme, Augsburger Kolloquium, Universität Augsburg, Institut für Mathematik, May 8, 2012. A. Mielke, On geodesic convexity for reaction-diffusion systems, Seminar on Applied Mathematics, Università di Pavia, Dipartimento di Matematica, Italy, March 6, 2012. A. Mielke, On gradient flows and reaction-diffusion systems, Institutskolloquium, Max-Planck-Institut für Mathematik in den Naturwissenschaften, Leipzig, December 3, 2012. A. Mielke, On gradient structures and geodesic convexity for energy-reaction-diffusion systems and Markov chains, ERC Workshop on Optimal Transportation and Applications, November 5 - 9, 2012, Centro di Ricerca Matematica ``Ennio De Giorgi'', Pisa, Italy, November 8, 2012. A. Mielke, On gradient structures for Markov chains and reaction-diffusion systems, Applied & Computational Analysis (ACA) Seminar, University of Cambridge, Department of Applied Mathematics and Theoretical Physics (DAMTP), UK, June 14, 2012. A. Glitzky, Uniform exponential decay of the free energy for Voronoi finite volume discretized reaction-diffusion systems, 8th AIMS International Conference on Dynamical Systems, Differential Equations and Applications, Special Session on Reaction Diffusion Systems, May 25 - 28, 2010, Technische Universität Dresden, May 26, 2010. A. Linke, Divergence-free mixed finite elements for the incompressible Navier--Stokes equations, Universität Stuttgart, Institut für Wasserbau, December 8, 2009. M. Ehrhardt, J. Fuhrmann, A. Linke, Finite volume methods for the simulation of flow cell experiments, Workshop ``New Trends in Model Coupling --- Theory, Numerics & Applications'' (NTMC'09), Paris, France, September 2 - 4, 2009. M. Ehrhardt, The fluid-porous interface problem: Analytic and numerical solutions to flow cell problems, 6th Symposium on Fuel Cell Modelling and Experimental Validation (MODVAL 6), March 25 - 26, 2009, Evangelische Akademie Baden, Bad Herrenalb, March 26, 2009. M. Ehrhardt, The fluid-porous interface problem: Analytic and numerical solutions to flow cell problems, Mathematical Models in Medicine, Business, Engineering (XI JORNADAS IMM), September 8 - 11, 2009, Technical University of Valencia, Institute of Multidisciplinary Mathematics, Spain, September 10, 2009. J. Fuhrmann, Mathematical and numerical models of electrochemical processes related to porous media, International Conference on Non-linearities and Upscaling in Porous Media (NUPUS), October 5 - 7, 2009, Universität Stuttgart, October 6, 2009. J. Fuhrmann, Model based numerical impedance calculation in electrochemical systems, 6th Symposium on Fuel Cell Modelling and Experimental Validation (MODVAL 6), March 25 - 26, 2009, Evangelische Akademie Baden, Bad Herrenalb, March 25, 2009. J. Fuhrmann, Numerical modeling in electrochemistry, Conference on Scientific Computing (ALGORITMY 2009), March 15 - 20, 2009, Slovak University of Technology, Department of Mathematics and Descriptive Geometry, Podbanské, March 17, 2005. A. Linke, Mass conservative coupling of fluid flow and species transport in electrochemical flow cells, 13th Conference on Mathematics of Finite Elements and Applications (MAFELAP 2009), June 9 - 12, 2009, Brunel University, London, UK, June 10, 2009. A. Linke, The discretization of coupled flows and the problem of mass conservation, Workshop on Discretization Methods for Viscous Flows, Part II: Compressible and Incompressible Flows, June 24 - 26, 2009, Porquerolles, Toulon, France, June 25, 2009. A. Linke, The discretization of coupled flows and the problem of mass conservation, Seventh Negev Applied Mathematical Workshop, July 6 - 8, 2009, Ben Gurion University of the Negev, Jacob Blaustein Institute for Desert Research, Sede Boqer Campus, Israel, July 7, 2009. E. Holzbecher, H. Zhao, J. Fuhrmann, A. Linke, H. Langmach, Numerical investigation of thin layer flow cells, 4th Gerischer Symposium, Berlin, June 25 - 27, 2008. E. Bänsch, H. Berninger, U. Böhm, A. Bronstert, M. Ehrhardt, R. Forster, J. Fuhrmann, R. Klein, R. Kornhuber, A. Linke, A. Owinoh, J. Volkholz, Pakt für Forschung und Innovation: Das Forschungsnetzwerk ``Gekoppelte Strömungsprozesse in Energie- und Umweltforschung'', Show of the Leibniz Association ``Exzellenz durch Vernetzung. Kooperationsprojekte der deutschen Wissenschaftsorganisationen mit Hochschulen im Pakt für Forschung und Innovation'', Berlin, November 12, 2008. M. Ehrhardt, O. Gloger, Th. Dietrich, O. Hellwich, K. Graf, E. Nagel, Level Set Methoden zur Segmentierung von kardiologischen MR-Bildern, 22. Treffpunkt Medizintechnik: Fortschritte in der medizinischen Bildgebung, Charité, Campus Virchow Klinikum Berlin, May 22, 2008. A. Glitzky, Energy estimates for continuous and discretized reaction-diffusion systems in heterostructures, Annual Meeting of the Deutsche Mathematiker-Vereinigung 2008, minisymposium ``Analysis of Reaction-Diffusion Systems with Internal Interfaces'', September 15 - 19, 2008, Friedrich-Alexander-Universität Erlangen-Nürnberg, September 15, 2008. A. Glitzky, Energy estimates for space and time discretized electro-reaction-diffusion systems, Conference on Differential Equations and Applications to Mathematical Biology, June 23 - 27, 2008, Université Le Havre, France, June 26, 2008. A. Linke, Mass conservative coupling of fluid flow and species transport in electrochemical flow cells, Annual Meeting of the Deutsche Mathematiker-Vereinigung 2008, September 15 - 19, 2008, Friedrich-Alexander-Universität Erlangen-Nürnberg, September 16, 2008. A. Linke, Mass conservative coupling of fluid flow and species transport in electrochemical flow cells, Georg-August-Universität Göttingen, November 11, 2008. J. Rehberg, Hölder continuity for elliptic and parabolic problems, Analysis-Tag, Technische Universität Darmstadt, Fachbereich Mathematik, November 27, 2008. A. Glitzky, Energy estimates for reaction-diffusion processes of charged species, 6th International Congress on Industrial and Applied Mathematics (ICIAM), July 16 - 20, 2007, ETH Zürich, Switzerland, July 16, 2007. J. Rehberg, Maximal parabolic regularity on Sobolev spaces, The Eighteenth Crimean Autumn Mathematical School-Symposium (KROMSH-2007), September 17 - 29, 2007, Laspi-Batiliman, Ukraine, September 18, 2007. A. Glitzky, Energy estimates for electro-reaction-diffusion systems with partly fast kinetics, 6th AIMS International Conference on Dynamical Systems, Differential Equations & Applications, June 25 - 28, 2006, Université de Poitiers, France, June 27, 2006. A. Glitzky, R. Hünlich, Stationary solutions of two-dimensional heterogeneous energy models with multiple species, Nonlocal Elliptic and Parabolic Problems, September 9 - 11, 2003, Bedlewo, Poland, September 10, 2003. H.-Chr. Kaiser, On space discretization of reaction-diffusion systems with discontinuous coefficients and mixed boundary conditions, 2nd GAMM Seminar on Microstructures, January 10 - 11, 2003, Ruhr-Universität Bochum, Institut für Mechanik, January 10, 2003.